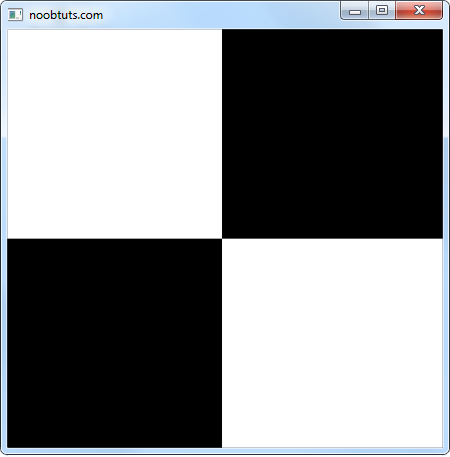 Let's make a Snake game in Python (in less than 100 lines code)! For those who don't know, the white thing is the snake. 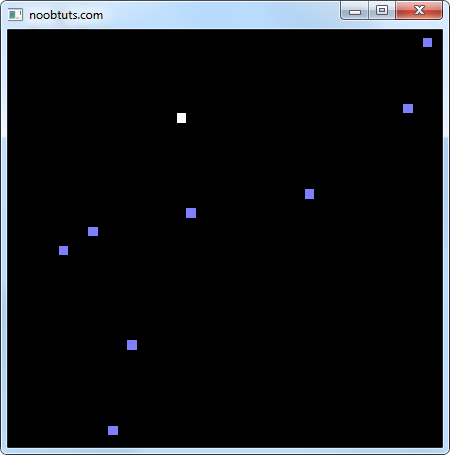 It can be controlled by the player to go up, down, left and right. Every time the snake eats one of those blue things (let's call it food), it gets bigger. Most snake games are a bit more complex though. There are walls that kill the snake when it runs into it, there is food that kills it if the snake eats it and there are different levels and speeds. However, to keep everything nice and simple, we will only focus on the snake and its food. 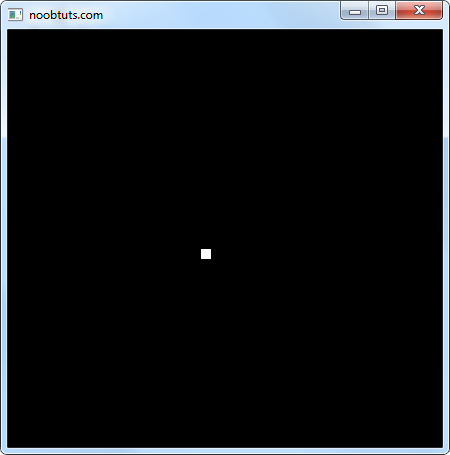 We will make this game with Python and OpenGL. 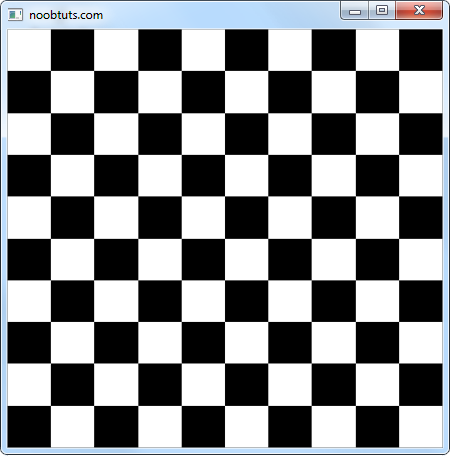 Please take a look at our Default Python IDE and Python OpenGL tutorials to learn how to set it up properly. Note: don't worry, we don't see anything yet if we run the program (except a black screen). The interesting thing about this code is the refresh2d_custom function. As a reminder, the refresh2d function in our Python OpenGL tutorial was used to tell OpenGL that we want to draw things in 2D. The custom refresh2d function basically does the same. The difference is that it takes two more parameters: internal_width and internal_height for the internal resolution. Please note that the internal resolution is completely independent from the window resolution. 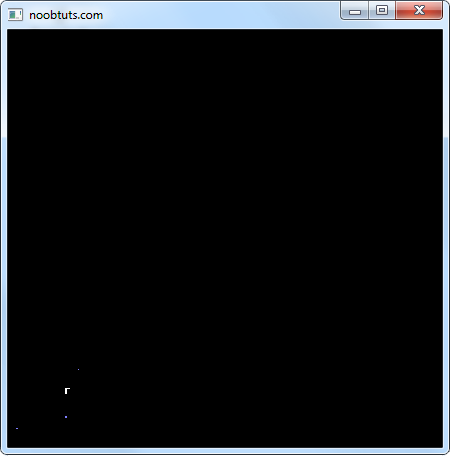 No this is not just a black window, there are some tiny little pixels in there. They are so tiny because our internal resolution is 500 by 500 pixels, so obviously everything looks really small. Every pixel that we draw is nicely visible without the need for a magnifying glass. Much better, right? Note: our game's internal resolution is hold in the field_width and field_height variables. Okay, now that we talked about internal and external resolutions, we can focus on the actual game. Let's create the main part of our game: the Snake. 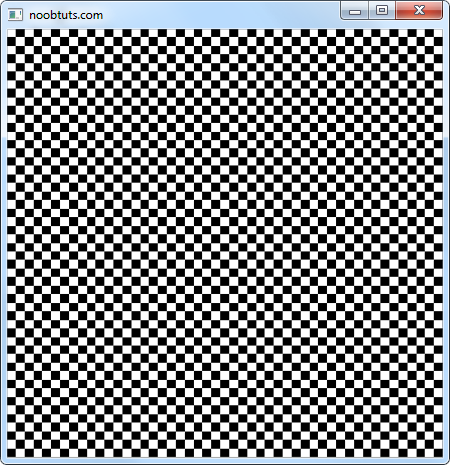 The snake is just a list of pixels at different positions. 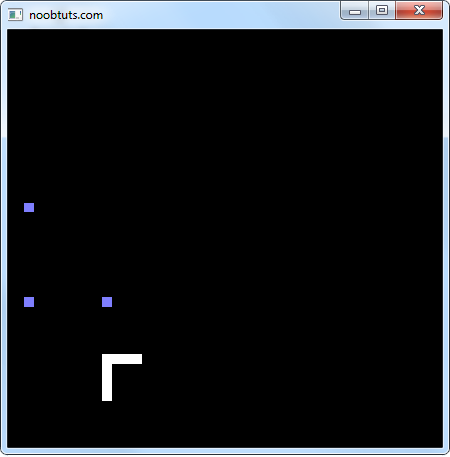 In the beginning it's only one pixel, after the snake eats something it's two pixels, then three and so on. The snake's head (the first element) will be in the first position in the list. Note: snake dir (1, 0) means that its current movement direction is x=1 and y=0, which means it moves to the right. We can see our snake's head, awesome! Explanation: in our OpenGL initialization we use glutTimerFunc to tell OpenGL that it should call our update function in 200 milliseconds (specified in interval). After we start the program, OpenGL will call our update function after 200ms. Our update function itself doesn't do anything yet, except tell OpenGL to call it again in 200ms. Hence we created our update loop. So the obvious way would be to create an algorithm that first moves the snake's head to the new position and then let's every other entry in our snake list follow the snake's head by one step. Instead of moving every single element by one step, we will just remove the last element and put it to the new position. This way it appears that the whole snake moved, even though we just removed the last element and made it the new head. Note: from a performance side, this is just beautiful. It means that in each update call, instead of doing "n" calculations ("n" is the snake length) we only have to do 2 calculations. This kind of trick can make the difference between 60 fps and 30 fps in bigger games. (3, 4) + (1, 2) = (4, 6). Note: more about Vectors in Python can be learned in our Python Vector tutorial. Note: snake is the first entry in our snake list, which is the snake head. One call to insert and one call to pop (which removes ("pops") the last element) does all the magic. If we run the game, we can now see the snake moving to the right all the time. Note: obviously we don't see all the magic yet since the snake only consists of one element. Note: this is just the way it's done, we won't worry about it too much. So what happens is that we create a random value and store it in our r variable. This value is between 0 and 20. Then we check if the value is 0 (which happens with a 5% chance because 100 divided by 20 is 5). If this happens we use the random function again to create a random x and y value and then we append it to our food list. So we created our snake, we added some food, but sadly the snake still doesn't know how to eat it. The good news is, this is really easy to do. In each update call, we simply find out if the snake's head (at snake) is at the same position as any of the food in the food list. If so, the snake will eat it (which means that the snake gets longer and that the food is removed). if hx == x and hy == y:  # is the head where the food is? 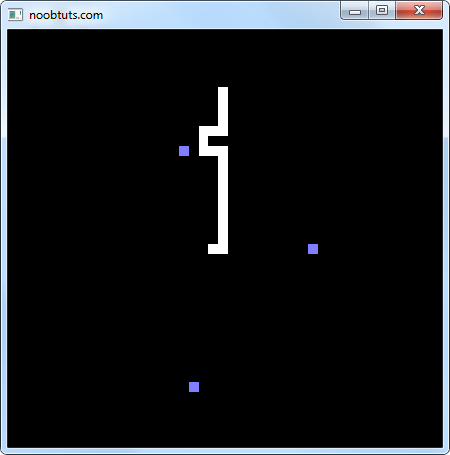 There we go, a lightweight Snake game written in less than a hundred lines of Python code. As usual, now it's your turn to make the game fun. Add different kinds of food, let the snake die if it hits the wall, add different levels and think about how to make the snake die if it collides with itself. Maybe even add some background music and a few textures. It's your game world, you can do whatever you like! The Python Snake Game source code & project files can be downloaded by Premium members.